Wal-Mart To End Sales Of Some Semi-Automatic Rifles, Citing Low Demand : The Two-Way The retail giant says that because of a drop in customer demand, it will focus on other hunting and sportsmen's firearms. An AR-15 is displayed at a National Rifle Association Convention. This fall, Wal-Mart will end sales of military-style rifles like the AR-15. Wal-Mart, thought to be the largest seller of firearms in the U.S., will stop selling military-style modern sporting rifles, such as the the AR-15, this fall. Wal-Mart spokesman Kory Lundberg said the decision to phase out the controversial semi-automatics was based in business, not politics, citing declining demand. "If you have a product customers aren't buying, you phase it out," he said, according to Bloomberg. He added that Wal-Mart shoppers "were buying shotguns and rifles, and so we are increasing assortment in that." "As our Sporting Goods departments are resetting this week from Summer to Fall, the MSRs are being taking out of the assortment and replaced with new rifles and shotguns." 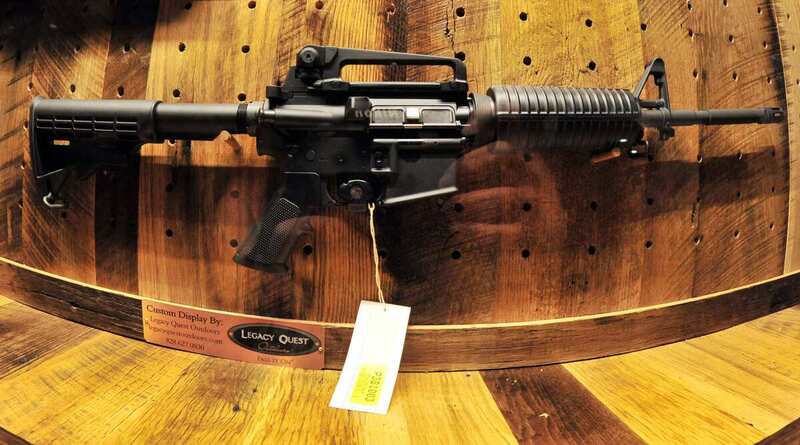 The soon-to-be phased out AR-15 was used in several high-profile shootings over the past few years, including the 2012 shooting at Sandy Hook school in Newton, Conn., and the movie theater shooting in Aurora, Colo. Gun control advocates support bans on these types of weapons and welcome Wal-Mart's decision to remove them from the shelves. Spokeswoman Lori Haas from the Coalition to Stop Gun Violence, based in Washington, D.C., praised Wal-Mart's decision. "I think it's a great idea. I think it's a great signal that things are changing and that we have responsible citizens reacting to the gun violence in our country," Haas told NPR. But while Haas embraced Wal-Mart's move, she questioned its claim that demand had indeed dropped. Wal-Mart does not disclose gun-sales figures. "It would be lovely if there had been a decrease in demand," Haas said, adding, "I would be very interested to learn of the gun manufacturer's sales." According to a spokeswoman for the National Rifle Association, Amy Hunter, the AR-15 is highly popular in the U.S.
"The AR-15 is America's most popular general use rifle," Hunter told NPR. In Hunter's emailed statement, the NRA called Wal-Mart's recent move disappointing. "While we're disappointed in Wal-Mart's decision, we appreciate the firearms retailers who continue to carry these firearms and enable law-abiding citizens to purchase the firearm of their choice." In 2006, Wal-Mart also cut back on gun sales, removing firearms from about a third of its stores, again chalking the decision up to "diminished customer relevancy." But then in 2011, it reintroduced guns to more stores around the country. According to CNN Money, a Wal-Mart spokesman said at the time that the retail giant "realized there is broader appeal for guns in some areas because of sporting needs." Wal-Mart will be selling the discontinued rifles at steeply discounted rates as it phases them out. An earlier version of this post included a photo of a weapon that was not an AR-15.